An excessive layer of thatch can cause problems for lawns by insulating your roots from vital nutrients such as air and water. Thatch is the layer of built-up plant material between the grass blades growth and the roots of grass plants. By removing lawn thatch you will reinvigorate your lawn. Thatch develops naturally as grass grows. Some thatch helps protect the roots, but excessive thatch prevents moisture, oxygen and nutrients from penetrating into the soil. It is okay to leave your grass clippings on the surface of the lawn after you mow, however mowing frequently prevents the buildup of thatch. Grass clippings are smaller and will decompose rapidly. Grass clippings can be recycled back into the lawn, simply by leaving the clippings in place. Newly sown seed will root in the thatch layer, and not the soil below. Thatch doesn’t provide the same insulation as soil, so the roots of dry out quickly, and the lawn dies. A lawn with a heavy thatch layer dries out faster, thus more frequent watering is needed. Fertilizers do not reach the soil below, thus fertilizer gets washed away or builds up. When this happens weeds and low rooting plants will feed off the shallow fertilizer and could take over a lawn. Determining whether your lawn has too much thatch is quite simple. 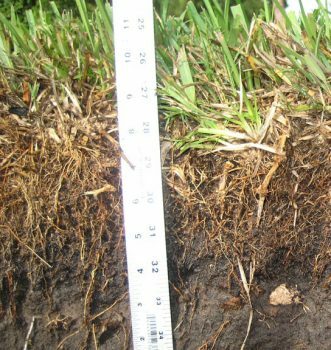 Remove a plug of lawn, and measure the layer of thatch between the top growth and the root zone. If it measures more than 1/2″ in depth, you should dethatch the lawn. For light thatch build up, you can use a lawn rake to collect the smaller layers of thatch. This method is for a more of a preventative maintenance approach. Rake in one direction to prevent damaging grass roots. Use a thatching rake will penetrate deeper into the lawn and bring up large amounts of dead material and thatch. Rake in one direction to prevent damaging grass roots. Once you remove the thatch layer, clean the lawn with a metal leaf rake. You can compost it and recycle it back into the garden if there are no weeds or diseased roots. Core aeration is a method main used for heavily compacted lawns, but with huge amounts of thatch built up, this method works. After you remove the thatch layer your lawn will look beat up, but it will recover quickly since the top soil is now exposed to the nutrients more readily. Water about and inch, twice over the next few days.